NTD! Best strat trem ever!!!!!! Discussion in 'Guitars in General' started by Blix, Apr 29, 2016. Well not technically new today, but I all forgot to make a thread when I got it. 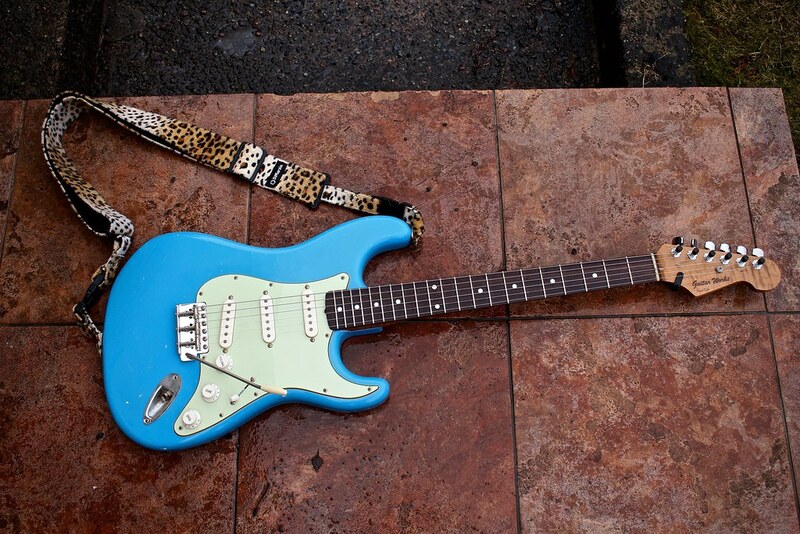 It's a trad stratocaster vibrato unit with a fun twist. 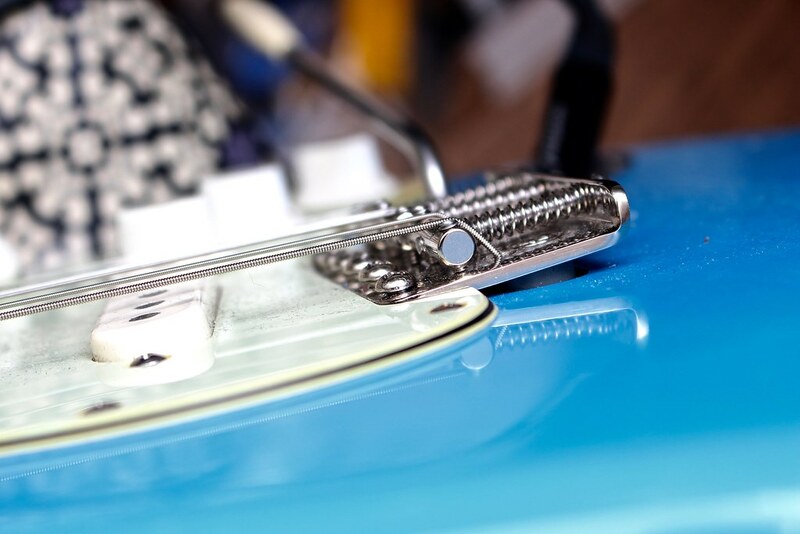 The saddles are chrome or nickel-plated brass, compensated so intonation is no issue at all! 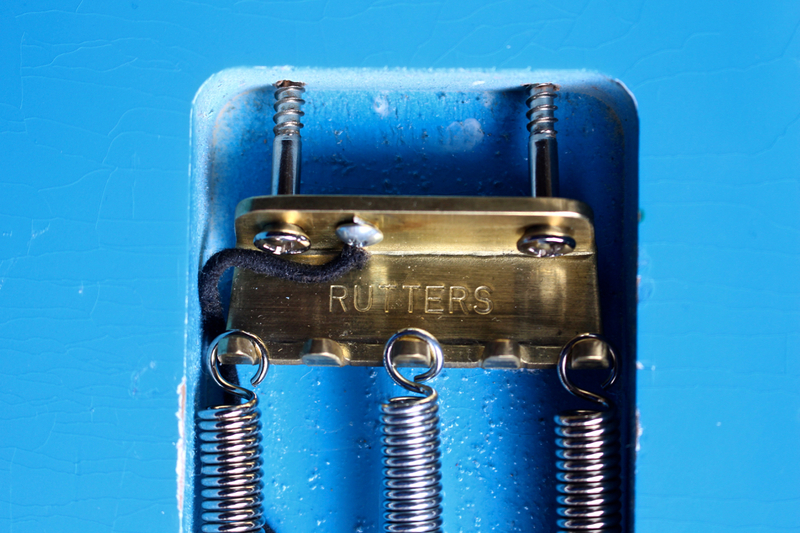 It replaced a Wudtone trem which where excellent, but I had some issues with the high E breaking, probably an easy fix, but I was intrigued by the Rutters when he posted it on his Facebook. The largest difference for me is how it changed the feel of my guitar compared to the previous trem, it feels slinkier which is awesome. For some reason I had to use two springs with the Wudtone, but with the Rutters I'm back to a more "normal" 3 for my 9-46 strings. The trem block material is secret, but whatever it's made of, if sure works! The price was $150. It's not shown on the website, but an email takes care of it. Steve1977, Ben Furman, hudpucker and 12 others like this. Nice work! What pickups are you using? The pickups are Wilde Alnico MicroCoils. stephax and Blix like this. there was a version of this some years back with angled saddles, but the problem was the strings would work their way down the "slope" with trem use, getting out of alignment. having straight but compensated saddles solves that problem, very cool. Boris Bubbanov and Blix like this. I am a huge Marc Rutters fan. Love and use his Tele bridge so no reason not believe he'd make a killer trem. Great sounding demo and nice tasteful trem usage! When Marc first came on the scene with his Eccentric slot compensation saddles, I felt right away with chrome plating they would be superb for Benders and Trems. Dale Clark had had this Chime Master bridge but he chose to use the smaller diameter barrels with slant compensation. 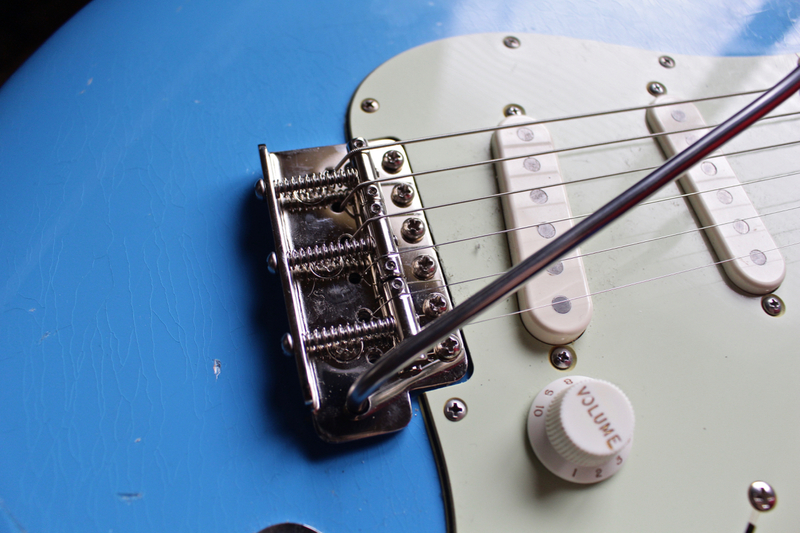 I felt like the strings would tend to relocate themselves everytime we detensioned them when we applied the whammy bar, so I tended to be really reluctant to hammer on the bar. Even when he did the Chime Master II with the Floyd style bar collar attachment (which solves the wear issue between the bar and block) I still saw evidence of string movement. I think Marc has licked a lot of the practical concerns of the combination of a 3 barrel design on a trem, here. The next thing I hope Marc works on is an even smaller diameter barrel. Either that or relocate the through holes through the plate and block and move them down the body 3/16ths inches more or less. Or do both. Part of the reasons so many Strats feel stiff IMO is the break angle is too steep and the string is almost wrapping around the saddle at the break point. Oh, I see a couple posts came in above mine while I composed my post. Absolutely +1 what Walter is saying, about string movement. Blix, Cgkindler and broken_sound like this. Yeah it sure keeps the strings in place, no issues. I think Marc has licked a lot of the practical applications of the combination of a 3 barrel design on a trem, here. The next thing I hope Marc works on is an even smaller diameter barrel. Either that or relocate the through holes through the plate and block and move them down the body 3/16ths inches more or less. Or do both. Part of the reasons so many Strats feel stiff IMO is the break angle is too steep and the string is almost wrapping around the saddle at the break point. FWIW, the Rutters trem made my guitar feel a good bit softer than the Wudtone it replaced, which is a huge improvement in feel to me! Marc makes some great stuff. 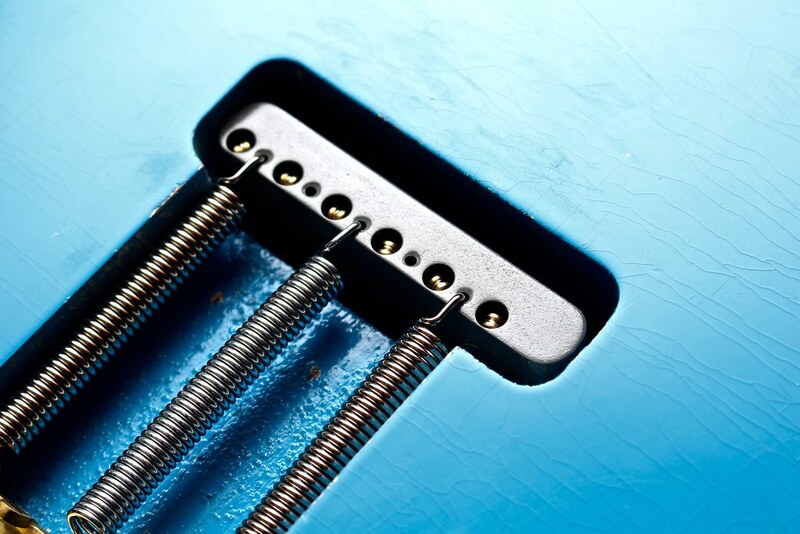 My tele bridge + saddles are absolutely top notch. And man, look at the thickness of that claw!!! Yeah, that claw is solid! The price was $150. It's not shown on the website, but an email takles care of it. I like your tone, as soon as you have your tone in the emporium, please let me know, i have first dibs. Cgkindler, Bob Pollock and Blix like this. The regular MC's does, not the alnico ones. Ha, you better be loaded! Cgkindler and macmax77 like this. LOL, i'll trade you my Forza Fiat! It is almost like a Ferrari, lol. I'd consider a working DeLorean, including a working flux capacitor..
Cgkindler and Blix like this. thanks for sharing man! Awesome tone/playing BTW! Thanks! This is why a decked trem is never an option! Bob Pollock and aynirar27 like this.